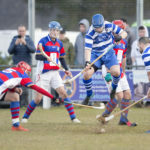 A first senior goal for Oban Saints’ youngster Keir MacLean helped spare his goalkeeper’s blushes as the normally reliable Graham ‘Sugar’ Douglas had an afternoon he will want to forget at Glencruitten last Saturday. MacLean’s strike put Saints back in control after two goal-keeping abhorrations had gifted opponents Neilston a way back into what, until then, was shaping up to be a comfortable West of Scotland Amateur Cup fifth round win. With the lead restored, a late brace from second half substitute James Ford put a shine on the scoreline and sent Saints comfortably through to the last eight of the West District’s premier cup competition. Management duo Donald Campbell and Willie Gemmell stuck with the same starting line-up which had put five past Dunoon in the previous week’s Scottish Amateur Football League Premier Division encounter at Dunoon Stadium and added the returning James Ford to a strong bench which also boasted the now free from suspension Campbell. Saints lined up with Graham Douglas in goal behind a back four of Ruaridh Horne, captain Dene Cassells, Dougal Graham and Scott Maitland. Matthew Kelly and Willie Gemmell occupied the holding midfield roles with a three of David Beaton, Lewis Cameron and Fraser MacFarlane supporting central striker Craig MacEwan. Keir MacLean provided the youth on the bench alongside experienced quartet Donald Campbell, James Ford, Kerr Newbigging and Steven MacLeod. 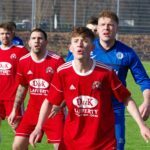 Visitors Neilston are putting together a credible challenge for promotion to next season’s Scottish Amateur Football League Premier Division and made a bright start with the impressive Ryan Anderson twice beating Scott Maitland to send dangerous balls into the box inside the opening two minutes. Neilston refused to let Saints settle and from the left wing David Millar sent Kyle Tannock through on goal with Graham Douglas coming quickly off his line to make a good block at the expense of a corner kick. Matthew Stevenson’s delivery from the left was headed clear by Saints’ captain Dene Cassells who, in the process, appeared to aggravate a back niggle picked up during the warm-up. Saints eventually awoke from their slumbers with Lewis Cameron forcing a fourth minute save from Neilston keeper Gareth Fulton low to his left. The back injury troubling Dene Cassells became too much to bear forcing Saints into a substitution after just 11 minutes. Steven MacLeod came off the bench to replace the skipper and join Dougal Graham in what was to prove a steady partnership in central defence. Good work from Willie Gemmell and Fraser MacFarlane in the twentieth minute sent Scott Maitland away on the left from where the fullback delivered a tempting cross which Craig MacEwan could only slice wide of Gareth Fulton’s left hand post. The momentum was building from the home side and the breakthrough came two minutes later from the left foot of Fraser MacFarlane. David Beaton and Craig MacEwan combined well on the right, with the latter laying a diagonal ball into the path of MacFarlane who threaded the ball through the legs of the advancing keeper to open the scoring. Gareth Fulton denied Lewis Cameron again in the 26th minute from another Craig MacEwan lay off as Saints maintained the upper hand. Full backs Scott Maitland and Ruaridh Horne combined to good effect in the 29th minute with Craig MacEwan once again failing to make the contact necessary to trouble the Neilston keeper. Maitland’s cross from the left was taken down well by Horne and squared to MacEwan who sent the ball spinning wide. Sixty seconds later Fraser MacFarlane came agonisingly close to doubling his tally making a good run on the right and steering the ball wide of the advancing Gareth Fulton but, unfortunately, also the bottom of the far post. A long straight ball into the box from Neilston full-back Nicholas McCardon was well held by Graham Douglas under pressure from Sean Crumlish with the Saints keeper launching a counter attack which saw Scott Maitland race away on the left and break into the Neilston penalty area. Maitland’s run was matched by Ryan Anderson who made a perfectly timed sliding interception to halt Maitland’s progress and clear the danger. The Saints left back continued to make a nuisance of himself and latched onto a well-measured Craig MacEwan through ball to send a low cross into the box for Lewis Cameron. Saints’ top scorer opted for a lay off to Willie Gemmell who saw his effort from 22 yards charged down on the 18-yard line by Ross Conway. The visitors countered with a long ball up to Kyle Tannock whose threat was nullified by Dougal Graham who comfortably mopped up the danger to see Saints through to the half-time interval good value for their slender lead. Saints kicked off the second half attacking the Mossfield end. They got off to the best possible start when Ruaridh Horne’s overlapping run and cross from the right was slotted home from eight yards by Lewis Cameron after 90 seconds. Straight from the re-start, Saints regained possession with Fraser MacFarlane setting up Lewis Cameron for a shot from a tight angle across the keeper but unfortunately also wide of the far post. A mazy diagonal run from left to right by Scott Maitland evaded four Neilston challenges before Ryan Anderson once again made a telling intervention to halt the Saints’ left back. A 51st minute foul on Lewis Cameron gave Willie Gemmell a chance with the dead ball from 28 yards, however, the co manager’s quest for his first goal of the season continued with a tame effort which Gareth Fulton was able to field comfortably. Young full-back Ruaridh Horne continued to press forward on the right where he was joined in the 55th minute by the overlapping Matthew Kelly whose dangerous low cross along the six-yard line sadly found no takers in navy blue. Saints’ high tempo start to the second half began to slow allowing the visitors a way back into the game which they were happy to accept. Slackness in the Saints’ defence gifted David Millar a 58th minute chance which Graham Douglas blocked with his outstretched left foot to deny the Neilston wide man. Saints made their first change on the hour mark with James Ford coming on to replace David Beaton. Saints’ policy of playing out from the back proved their undoing in the 63rd minute when Graham Douglas allowed the ball to roll under his feet and was robbed by Liam Hughes who squared to Kyle Tannock for a simple eight-yard tap-in. Donald Campbell and Kerr Newbigging entered the fray in the 68th minute at the expense of Fraser MacFarlane and Willie Gemmell just moments before a major let-off when a Ryan Anderson lob from the corner of the box landed inches wide of target with the Saints keeper stranded. Neilston worked hard throughout and were rewarded for their endeavours in the 71st minute when a seemingly routine save from a David Millar shot spun away from the gloves of Graham Douglas and nestled in the bottom corner of the net behind the red-faced keeper. Full-back Ruaridh Horne limped off with a hamstring strain to be replaced by young striker Keir MacLean who would make a telling impact on proceedings. Saints knew they had to up the tempo to regain control of the match and forced a good opening on the left which saw Lewis Cameron tumble in the box under a challenge from Ryan Anderson which referee Tam Gilchrist saw nothing wrong with. The Saints number one’s blushes were spared in the 81st minute when Donald Campbell and Craig MacEwan linked up well to set up Keir MacLean who cut in from the left and slotted a cool right foot finish from nine yards past the advancing Gareth Fulton and into the unguarded net. The Saints’ youngster thought he had doubled his tally four minutes later firing high into the net from a similar position after Gareth Fulton had done well to parry a Donald Campbell shot. Mr Gilchrist, however, cut short MacLean’s celebrations ruling that the young striker had strayed offside. James Ford made the tie safe for Saints in the final minute of the 90 finishing off a good move on the left involving Scott Maitland, Lewis Cameron and Donald Campbell with a left foot finish from a tight angle across the keeper and in off the far post. Nicholas McCardon hooked a Keir MacLean header from a Lewis Cameron corner kick off the goal line before a late tackle on Cameron by Neilston substitute David Young, coupled with a spot of retribution from Matthew Kelly, had players on both sides reaching for their handbags in the second minute of the generous amount of time added on for stoppages by the referee. The experienced Caledonian League whistler, one of the top referees in Scotland, quickly restored order issuing yellow cards to Lewis Cameron, Matthew Kelly, Kerr Newbigging and Neilston’s Gareth Fulton, Robbie McNamara and David Young. The action continued into the 97th minute when a well-measured Donald Campbell cross was taken down at the back post by Craig MacEwan and squared to James Ford who cushioned a volley past the left hand of Gareth Fulton and into the bottom corner of the net rounding off the scoring and sending Saints safely through to the sixth round. Saints return to league duties this Saturday when they travel to the tail o’ the bank to face Inverclyde.